New Jersey Governor Chris Christie’s carefully cultivated image as a tough guy who “gets things done” by compromising and working with Democrats was shattered this week. 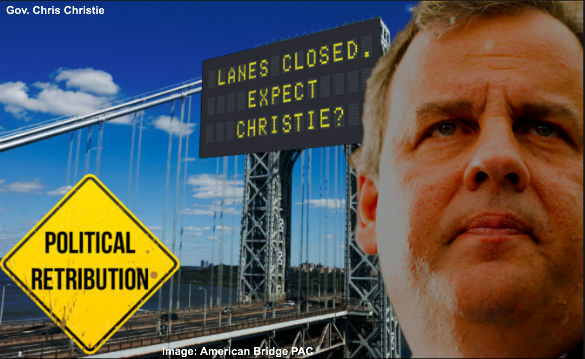 Media reports have revealed this week that one of Christie’s top aides used the power of the Governor’s office to cause a monumental traffic jam in Ft. Lee, New Jersey whose Mayor had refused to endorse Christie in the 2013 New Jersey gubernatorial campaign. The traffic jam contributed to the death of a woman whose call for an ambulance was delayed due to the traffic jam. Christie, a favorite of the Big Government Republican establishment and one of their top choices for President in 2016 conducted a 90 minute news conference on Thursday to try to answer questions about what he knew and when he knew it, but he may have seen his presidential ambitions fatally wounded in the growing scandal. Christie’s famously combative personality and tough guy ripostes to hecklers and hostile media questions no doubt appeal to those who are unhappy with the Republican leadership’s lackluster milquetoast responses to President Obama and the Democrats. We think we have our answer on that one now that Republican primary voters have seen where “Jersey tough” leads. Christie may be telling the truth when he says that he did not authorize the politically motivated traffic jam and knew nothing about the plan to inconvenience the people of Ft. Lee because their Mayor wouldn’t support him politically, but that’s really beside the point. Who you walk with says a lot about who you are. Unfortunately, Chris Christie may be a brawler, but there is no record showing that he walks with limited government constitutional conservatives. The most important contribution the “Bridge-Gate” scandal makes to the 2016 Republican presidential contest is not what Chris Christie knew and when he knew it. It is that “Bridge-Gate” confirms that Chris Christie surrounds himself with people who share the same kind of thinking that led to the extra-constitutional Obama Administration abuses in a host of scandals: the IRS targeting of conservatives, use of the EPA to “kill” the coal industry, the NSA trampling on the Fourth Amendment and eventually to Obamacare and its bullying of citizens on the most intimate details of their lives and religious beliefs. Instead of walking with people who oppose bullying government in all its forms, what the “Bridge-Gate” scandal has shown is that Chris Christie surrounded himself with people who see Big Government as a handy political weapon. The last thing we need is a Big Government Republican like Chris Christie as President because he will bring to the White House and his Administration a bunch of Republican versions of Eric Holder and Kathleen Sibelius who will continue to use government as their weapon to punish political opponents. Christie not just a bully, but a situation architect. Submitted by smapple on Sat, 01/11/2014 - 14:11. Spending more than two hours talking about the "scandal" makes me say "me thinks thou dost protest too much". Was this a set up so that he could show his leadership skills to a doubting republican voter block? I have noticed all the conservative talking heads coming out in s support of him in droves. The same ones who have been criticizing his RINO credentials all along. One thing for sure is that it has made the statement to Barack Obama that Chicago Politics has nothing on New Jersey politics. Heck, New Jersey invented the mob. Submitted by John B. Rosenman on Fri, 01/10/2014 - 18:13. This article is persuasive. You don't have to know something to sanction or permit it. All you have to do is slip the folks you surround yourself with, your yes-men and subordinates, a subliminal or even a subconscious wink and a nod, and they'll do it for you. It doesn't even have to be intentional; if parts of your style lean that way, they might very well feel free to interpret your will as they see fit. And they'll grin and call it "plausible deniability." I suppose I should like this brash, sometimes free-thinking, cross-over maverick. Hey, he linked arms with Obama himself when the hurricane ravaged his home state. But though I like some of the things Christie has done, I can't forget the time he bullied a man during a press conference just because he could and because he didn't like the question and because he was an intolerant and arrogant SOB. And we learned later the man was a decorated member of the military wounded in the service of his country. I can't forget that. Somehow this bridge-gate incident seems to flow naturally from that. If Christie didn't know about this abuse which came from his staff, I find it hard to believe. Either way, he bears much of the guilt, and he didn't look especially presidential in his nearly two hour press interview yesterday when he acted like he was the main victim. Submitted by al.78.1931 on Fri, 01/10/2014 - 17:18. I lost confidence in him when he walked with OBAMA during the last election. Submitted by Longdrycreek on Fri, 01/10/2014 - 16:01.
as Christie or Obama or Biden or any Democrat or Republican? Submitted by jenniges3 on Fri, 01/10/2014 - 15:48. I am not a big fan of Christy. What I will say is: he has integrity when it comes to what he believes. I don't care for all of his social issues and his big government approach to manmade global warming or his solutions. Where does he stand on coal? I think as a leader he leads and if nothing else that is refreshing. He is a financial conservative and a pragmatic leader. He is not my candidate for President but he is better than McCain and other Senatorial wafflers. I believe we need a governor to be our next President. Maybe one or two Senators reach the status but they have no CEO track record which is bothersome. Jeb Bush is out of the running. He is nothing but another Obama. When you don't allow drilling off your coast line. Your not for America. A strong America is an energy driven fossil fuel America. Not one relying on countries that hate us and can blackmail us with their oil. Submitted by FSHNT21 on Fri, 01/10/2014 - 14:42. This scandal will not hurt Fat Boy's chances of getting on the 2016 presidential ballot. Besides, Democrats are immune to "scandals". Submitted by jodantec on Fri, 01/10/2014 - 13:59. If Christie was unaware then his leadership in firing the perpetrators of the event that led to the crisis was perfect. He is the only true and consistent republican or democrat deserving to be called a leader. His 107 minutes addressing the facts is what I expect from leaders. Compared to the Bozo Obama he is outstanding. Christie is a true leader of people who says what he means and means what he says and Governs from the Center; exactly what this country needs. I admit I also find similar qualities in John Thune and Mitch .... the ex Gov of Indiana. Submitted by Julian Alien on Sun, 01/12/2014 - 20:18. New Jersey has a looong record of being a completely corrupt state, only to be outdone by Chicago, a soon to be separated annex of Illinois. Christy just kept the ball running. They have tapes of him in compromising positions and he will do whatever they tell him to do. Just another puppet. Are you really suggesting that Rand Paul's staff would "go vigilante" and then he would have to apologize for extremely unethical and illegal policies? Normal behavior? Preposterous! I point you out as a shill or a gullible fool. Submitted by rosugill on Fri, 01/10/2014 - 13:53. It is totally beyond me as to what Christie would have to gain by this extremely moronic act. I am not a Christie fan, but I don't think that the man is stupid either. Doing something like this was very stupid and there was absolutely nothing to gain by doing it, therefore, I do not believe that Chris Christie had any knowledge of it. I just can't believe that he would do anything in which he had nothing to gain, and this piece of stupidity was a juvenile and very imbecilic thing to do, and there was absolutely nothing to be gained by doing it. Submitted by Michael Laborde on Fri, 01/10/2014 - 13:22.